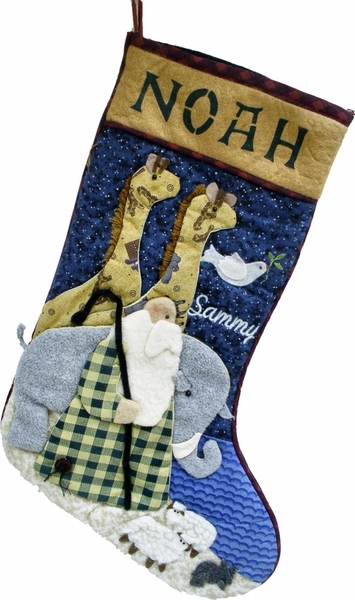 This stocking has Noah featured with two large giraffes, an elephant, some sheep and Doves along with other animals on his way to his ship.With the waves in the background this stocking is just absolutely adorable. Although it is difficult to personalize, we had to offer it because it is so beautiful, well made and it embodies The True Spirit of CHRISTmas. Measured Measured along the diagonal from the top left hand corner to the toe, the stocking measures 23 inches, and the width along the cuff is 8 inches. Materials: The stocking is handcrafted from linen, cotton, fleece and wool materials. Lining: YES. The stocking is lined on the front side with a cotton and polyester blend to protect the integrity of the stocking. Names will be personalized on the body of this Christmas stocking with embroidery thread to compliment the colors of the stocking and the design on the stocking.